The Classic French was blended and roasted for you by Tony's Coffee. Classic French is Tony's darkest, heartiest blend. While they’re always refining their roast profiles, they like to think of this coffee as an homage to the roasting style of 1971 - the year of Tony's was founded. We find this blend to be a particularly tasty dark roast, with rich notes of molasses, hickory and smoke. both my wife and I really enjoyed this. It was my favorite so far. Favorite one we've tried so far! Overall a good cup of coffee. Love the smoky and chocolate flavor it has. A little on the sweeter side for me, but really enjoy it so far. Really smooth and rich. Easy to drink. Enjoyed the coffee! French roast is my go-to coffee. Tony’s os a good coffee. I’m partial to French Roast, but dropped a star because I thought the flavor was a bit off (perhaps the molasses). It had an acidic aftertaste. So. Perhaps I’ve never had a truly good French Roast before. Regardless, this is among the best coffees I’ve ever had. Many thanks. Awesome coffee. Husband loved, loved it!! A little hard on my tummy. A better choice than Drifter's Kickapoo. Smooth and full bodied with no bitter aftertaste. I love this coffee, it's rich and smooth, no bitterness at all. I'm learning to drink coffee black instead of "light and sweet" and this coffee allows me to do that. It's delicious! Absolutely loved this coffee. It was really enjoyable and I could even taste the care of the smoky hickory that goes into it. I will be looking more into Tony's in the future! Loved the flavor! Very smooth. Too acidic. Very disappointing as this was my first experience with Misto. I said in my survey that my least favorite Starbucks blends were French and Italian, yet that is all you have sent! This was a gift and I will NOT be renewing. I am sure this coffee is good for someone but do not fit my profile. Nice round flavor. Rich but not too burnt. I didn't feel like it had that deep intense flavor. A bit weak for me unless I used double the recommendations. I liked it very much. It was smooth and earthy but not tart. I'm looking forward to finding the coffee that will "Knock my socks off." I don't usually like dark roast but it had a lot of character, it was fun to try something different! Brewing with the Keurig my coffee tasted a little watered down. I think I would like to try a stronger coffee. I set my brewer on the strong setting and did 8 ounces. It was better using the 6 ounces. Wow! You guys completely NAILED it out of the gates. This is a great coffee and right up our alley on all notes. Really love everything about this gem. Thanks so much! Great work, Mistobox! Tasted maybe a little too fruity. The flavor wasn't quite as smooth as we'd usually like. Took a few cups to grow to like it. But overall, we are enjoying it! I tried it in my French press, automatic drip, & in my Kurig. Great! Rich and perfect for me. Not the best coffee I've ever had, but very good. Nice smoothness without over bearing or acidic aftertaste. Enjoyed this one thoroughly! Wanting more but also wanting to try others. So many coffees, so little time. Certainly rich, bold, although slightly acidic. Enjoyable more as the morning jolt than sipping late morning or early afternoon. I liked the Classic French Roast. It is very rich, which I like. I am also into the caramel-y notes...I think that the smoky-ness leave a bit of an unpleasant aftertaste...I like it on my tongue, but not after I have swallowed it... lol. Hope that makes sense!! I liked this coffee. It was smooth. Didn’t notice any fruity/acidic flavors (which is a good thing). Definitely tasted caramel which I really liked. I swear this coffee gave me the worst coffee breath of my life . . .
A little on the greasier side for the machine, but delicious flavor. Thank you! I used it to make iced coffee as well as hot coffee in my french press. Great flavor and hit all the right notes each time I brewed it. I thought this coffee was good. I tried it both using my aeropress as well as steeping overnight and making cold brew. I preferred this coffee hot rather than cold. The flavor profile wasn't as distinct as I would have liked. Was good. Would like to try something from Costa Rica. Great flavor exactly as described. Really enjoying it. Thank you! I thought it had a smooth, but robust flavor. This was a coffee that I would definitely drink again. Wonderful coffee. I prepared it a few different ways and varied grind settings. Was wonderful each time. Nice strong bold flavors with a lingering Smoky and nutty flavor. Just the right amount of bitterness. Would purchase again. We liked the low-acid profile and finish of the coffee. It was amazing. We really enjoyed the flavor. The coffee seemed one dimensional and lacked a full bodied flavor profile. Probably a filler bean mix from central and south America. really about 4.5 stars. There is an espresso grind I buy locally that I compare everything else to, and this one was quite close. I love the classic coffee flavor of these beans, which make for a hearty and warm cup! This is right up my alley in terms of the deep flavors. Almost perfect. Could have been a little bolder for my taste. 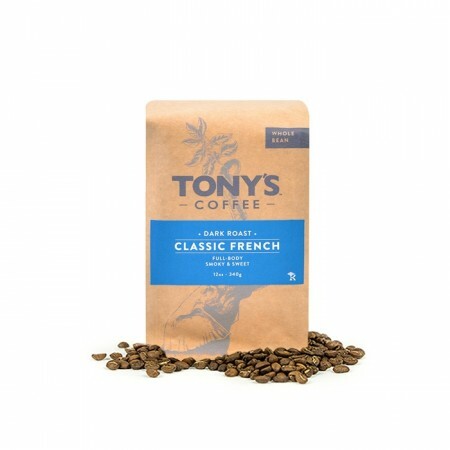 I have been drinking grocery story beans so first impression of Tony's Classic French was much better than store beans. I plan to go back to store beans for a couple days to be able to make better comments. It was very good. We don’t usually like french roast, but we liked this. We typically go for Indonesian darks. A little darker and smokier than I prefer. It was very fresh, so that is a big plus. Very bold and smooth. Very nice aroma and flavor, a little bit burnt tasting but I won't have any trouble getting through the bag. Good coffee, perhaps a little more earthy than I usually like. May be the time of year as well, in the winter, coffee with a little more distinct flavors give me something to think about rather than just the earthy notes I may prefer in the summer. Bold and beautiful...is still get a hint of fruit. Fantastic. Rich, smoky but no hint of bitterness. This coffee was weaker than we would have liked. Very smooth and silky with wonderful dark overtones. Aroma is amazing. Is there a coffee that is richer/thicker or more flavorful that I could try? I like this coffee a lot, feels strong and dark enough. Tast-wise, I could even do a little darker. Overall an amazing coffee, thanks! Delicious. We thought this coffee was great – bold and flavorful, but still smooth and drinkable. Loved it. Did not like it. Tasted like burnt coffee. Tasty. Freshly roasted. I like French roast's, but I don't love them. I am a fan of dark roasts but prefer the ones that are a tad less smoky . That being said, this was a great coffee and I would purchase. I am looking forward to tasting others as well. I liked this coffee. We usually buy a dark, Jamaican blend. Do you have anything like that? It’s dark, rich, and slightly flavored. Rich and caramel do seem like good descriptors (I did not get smoky), and I liked it. I drink coffee black and pretty strong, hot when I start and pretty cool by the end, so I like a coffee that tastes good at both temperatures. A little milder than Peet's Major Dickason's blend, which is my favorite. A good coffee I would drink again. We enjoyed this coffee. It is very smooth. Low-acidity, very little "bite" - almost to the point that we would prefer a bit more roughness (personal preference). But, this is definitely a great coffee! Really good! The smoky notes really came through. Very rich. Really liked this coffee. I like dark and rich w chocolate notes. Not sure about Smokey in a description but this is very good and I do like it. This is terrific coffee. The fact it was roasted about 3 days before I began to enjoy adds to the freshness and appeal. Chocolate and caramel notes are easily distinguished and the coffee is exceptionally rich. It has medium acidity. My drip brew grind from you guys matched well to my French Press brewing technique. Good first choice for me. Thank you. I liked it for a French Roast, even though I think I wrote something about not wanting French Roasts in my flavor profile. It did have a pretty good rich flavor, with some smokiness present. In the future avoiding French Roasts would be great, but this one was pretty good. It was strong and smokey, but it had more of a bitter end than I prefer. I tasted creamy chocolate. The roast was perfect. These comments exhaust my coffee vocabulary! It was ok. Not as flavorful as I would like. I’m a neophyte, so take this with a big grain of salt. I didn’t find this to be as full bodied as I’d have thought. It was smooth, but kind of boring. The caramel was not apparent to me. I’d be open to any suggestions for something a bit more interesting. Nice and smooth, liked the dark roast. Would like to try something also dark roast, but with a bit of a bite.....(not as smooth)...fruity or citrusy, definitely NOT burnt or smoky. I would prefer a bolder flavor. Really enjoyed this one and very fresh. Good to drink black or with a creamer. Was tasty. Definitely in the right ballpark, could go richer with less bite. It is a good choice. I like the low acidity. I only drink coffee first thing in the morning and like something pretty strong. I'd like to try a darker coffee. I need to keep using it to give it a fair review. I have a cold and don't think my taste is as helpful as usual. Great coffee, very much aligns with my taste and what I typically drink! Now that you’ve nailed down my palate, I’d like to try something slightly different. Perhaps something with chocolate and berry notes? It’s a little too dark for my liking, but my bigger problem is I feel like the coffee lacks depth. All I taste is the darkness without any real richness. It's a little too bold of a flavor for me I think. I just got an espresso machine, so I think I want something a little different next time. This was delicious! My husband and I quite enjoyed it. Good beginning taste. Kinda flat tasting body and end. It’s Better a little cooler temperature. This coffee was excellent. Please send more like this. I really enjoyed this coffee! I really liked this coffee. It was bold but not too acidic. It was very smooth. I did taste the hickory and smoke flavors. (I am not very good at tasting notes). I liked that it was bold and rich when I first tasted it. The smell as the coffee was brewing made me think it was going to be almost overpowering, but it was nicely balanced. My one negative was the almost burnt characteristic of the roast. Great first coffee! Can't wait for the next one! Very smooth cup of coffee. I like coffees that are a little more bold but this was still quite enjoyable. This is an excellent coffee...rich and tasty. Just how I like it! It was a little too dark and smoky for my taste. I think I would prefer more of a medium roast. I also found it to have a hint of bitterness to it. I could tell by the smell of the beans in the package that this coffee would be delicious. I usually drink 2 Cups but since this new coffee bean arrived I had at least three cups per morning! Absolutely delicious. First off the bag is beautiful! I loved the nose on it, and really liked the earthiness, but it tasted a little burnt to me. I wish it had a little more butter, caramel or nutty notes mixed in. Was a little too bitter. It was good. I'm not a fan of French Roast so difficult for me to say if it was great. It was not as bold as I like but very smooth and enjoyable none the less. Good taste. Fairly rich, though not as deeply flavored as I expected from the description. A good dark roast with a decent level of boldness and smokey for me. The tone being described as caramel or molasses I didn’t love, but for my first Mistobox delivery, this blend is definitely on the right track. I look forward to comparing this to the next one! I liked the flavor, smoky with more sweet than I prefer. Great aroma. I brew in a Keurig Vue with a My K Cup, and put in 3 tablespoons, brew a 12oz cup on strong mode. I like my coffee strong, black, nothing in it, so while good and different would prefer a stronger dark roast. I am a Starbucks Dark kinda guy. Coffee grind is too fine and will not pass through paper filter. I use a nice Technivorm Moccamaster and have never had an issue. Overall, this coffee was pretty good. I am not sure if I made it too strong as my initial thought was there was a taste I really didn't like. Maybe it was the smoky aspect of it. I will try brewing another cup today with a bit less coffee and see if that makes a difference. Update: after brewing a couple more cups with a little less beans, the flavor was better. It still is a very robust bean, but I do like it. I love it! nice dark beans, good to the last drop. no bitterness, just rich coffee taste. I would describe this coffee as smooth and rounded. It tastes lighter to me and I don't think I would use the word rich to describe it. The smell was amazing, I could smell the coffee even before I opened the box or the bag. But the taste of the brewed coffee was more reserved. I think I prefer coffees that are bolder. Too bitter, ended up trashing. Good rich aroma but the flavor is a bit one note. Not a fan if French roast. It was weak. Smooth and chocolatey. A hint of smokiness, but no bitter notes. Deep and flavorful. Robust and hearty. I love this coffee. It has a rich caramel taste with some chocolate notes. It is smooth and non-acidic. The smokiness is minimal. I would definitely buy this. Did not care for this batch. Has a bitter burnt after taste. Nice flavor; a bit milder than I'd generally prefer. Seemed fairly typical of French roasts. Not bitter, but terribly memorable. This has been my favorite by far!! LOVED IT! One of our favorite coffees yet. More like this one please. Like the last one, I loved the bag! Flavor OK if finely ground for pour-over or drip. Made a decent espresso, but not very robust. Guess I'm still spoiled by my original Double Dark! This coffee had a sweet taste and easy to drink black. In fact I preferred it black. The notes of smoky and caramel are on the money -- though perhaps my brewing method (pour-over) didn't draw out the richness, or I just don't know how to look for that aspect. This was a good coffee, but not as good as the Double Dark from Shipment #1 -- not dark enough, that is -- when it comes to a powerful morning brew. I'd characterize this one as ideal for a "second cup," for a dark-roast lover (like me). Is there such a thing as a strong light roast, just out of curiosity? Since I tend to buy only dark for myself, I'm just wondering if I should use this gift opportunity with Misto to try something I wouldn't ordinarily select? Regardless, I'm curious to see what you select when it comes to the next batch. Well balanced, not bitter, great fragrance and taste. One of my favorites so far. Too much smoke. So much so that I could not really taste anything else. little too rich for me... Like something like the Italian Blend better. OK , smokey, but difficult to say rich and cant taste caramel. Might be my favorite coffee I've ever brewed at home. Very good. So good that experimentation should be around the edges. I thought this was too dark. Hard to pick out any flavor notes. Was not one of my favorites. This coffee was also awesome especially for my soy lattes! Although I loved it I did like the first one a little more. This one I felt was quite a bit more smoky than the first and I think that’s a note that I don’t desire as much. It wasn’t overwhelming, but compared to the first coffee I liked it less. Great cup. Favorite so far! Not happy with two shipments so far. Does not have any flavor of coffee. coffe was very strong with no flavor. please cahnge to medium roast. Can I exchange 2 nd shipment not yet open (working on the foirst shipment now) and replace with a different coffee? My favorite so far! Great coffee, rich and bold, and I love that the company put so much pride into the actual bag the coffee came in! So much fun! I do like It but I really liked the previous one a lot. First one is still my favorite out of the two. I liked this roast very much. Next time, I think I would like something just a bit bolder. Thank you. Bitter after taste otherwise it was pretty good. I tried a larger grind but the taste seemed watered down. Very good, I like how dark and strong it is. Makes a good espresso. With aero press it works better with a bit of cream and a tiny dash of turbinado sugar. Excellent in a latte or cortado. Robust flavor with chocolate undertones. Great smell. Beans are fairly oily, makes great drip coffee, have not yet tried espresso. its not terrible but the flavor is just okay. there is indeed notes of molasses and syrup, but it is too dark for me. Pretty good. A little fruity. Notes of fig. These beans have been really tasty and rich and I've enjoyed the coffee a lot. They also seem to have more oil than the Verve which I like, not sure what that means! I do slightly prefer the Verve that was my first delivery, not sure exactly why, I guess just the overall flavor. It's clear that I prefer the dark French roasts so you've nailed that! However, I'd like to try something totally different for my next delivery-still a dark and rich roast but perhaps a bit different on the flavor profile. I'm curious what you might come up with! Thanks Seth! We love the this one because the aroma is wonderful (actually they all are). The body was just right. It was balanced and it was clean. I love the strong flavor of this coffee. Good, but not as bold or flavorful as the first selection and the after taste was not as enjoyable. Still, a good solid cup to get the day started. good. I enjoy a dark roast and felt like there was not as much depth of flavor as I would have liked. This coffee tastes ok, it's just very very thin. Ended up steeping it for much longer than normal and also use quite a bit more beans to get to a flavor that I enjoyed. Comparing to what I had left of my previous blend really showed, to me, how little I preferred this one. Loved this coffee. I could taste the hints of caramel right away, along with the flavorful aroma. Great pick for my second selection. Tasted great, very easy to drink, no acidity. Great coffee, definitely one to drink each morning. Excellent flavor, smooth even without creamer. Could be richer in flavor maybe. This one wasn't bad at all, it was just okay - middle of the line average. Wouldn't mind others similar at all but definitely enjoyed the previous one significantly more. I enjoyed the smokier flavor of this coffee, as well as the rich aroma it gave off. It was really good but didn’t seem as dark tasting as I expected. I liked it; Deb thought it was a bit acidic. Liked the aroma, as well as the smoky, earthy flavor. I like the dilannos better. This one is good, but not as strong as the first one. Much better than first coffee. Still not a "rich" flovor for me, but enjoyable for sure. Good, but a bit strong and smoky. We are huge fans of dark roast, so we were very pleased when we brewed this for the first time. I like the smoky flavor! The aroma was fantastic, and it filled up the entire house which was great. Unfortunately, it was lost when brewed along with the flavor. Good flavor. Very smooth. Not as smoky as the Dillanos Classic (my first coffee), which I prefer the less smoky. Just picking up a hint of the caramel (could be my grind and brewing). Combining the chocolate of the Dillanos, with the less smoky I feel of the Tony’s Classic French, in a bold coffee would be great. Perfect coffee for me. Love it. The flavor was mild and indistinct. Prefer darker roasts. Nice smoky flavor. Love to see oily beans! I really enjoyed this one! It was flavorful yet not bitter. I think I like coffees that are on the "sweeter" side. I found this more subtle than the Dillanos blend, and had to use more coffee to get the real sense of it. I definitely got the smokey aspect of this blend. I will have to try it as an expresso for my next taste. pretty tasty though not as robust as other french roasts I have had. I liked this coffee better than the Dillanos. I liked that it was dark and smooth, no bitterness at all. Nice richness and dark roast. A little acid and not the heavy roast or boldness that I think of in a dark roast. Excellent! As described, classic flavor; rich and smoky. Nice rich flavor, clean finish. I feel it's a bit lacking in aroma (when brewed) but really good coffee. Solid roast; a little oily. Prefer slightly milder. Delicious - dark, robust. Excellent cup of coffee. I couldn't really taste the caramel and is nowhere near as bold or rich as the Double Dark Blend. It is very different from the previous coffee but its understood that it will be a lot lighter in all aspect. Shall try for a few more days before updating notes to get a better taste for it. Excellent, no bitterness, make in full auto espresso machine: academia gaggia, beans are highly aromatic and quite oily, Had to rake beans in hopper to keep flow going. good caffeine kick - drink 4 shots at a time to get going. Roast level is good, rich without that burnt flavor some dark roasts have. I must have dead taste buds, no carmel or smoke flavors to me , I just taste coffee??? but I like it. It's french roast. Nothing special. Not my favorite roast in general. Made good cold brew for iron limes though. Love this blend. It's dark, but smooth. This is my favorite coffee so far! Just a really good blend. You guys are on a roll! Keep the good coffee coming! Looking forward to more dark roasts for the winter! this was good, but we liked the first one better. We definitely prefer the nuttier flavors. I really like the way this blend tastes. It is strong but not overpowering. Has a great bold flavor. I liked this more than the first coffee, but still too smokey. The flavors are a little too dark and heavy. This coffee has a smooth yet bold flavor that I enjoy in the morning! Love the smokiness of this. Perfect way to start the day. Bold and rich, not much complexity, but the smoky flavor is definitely there. Balanced and smooth. Not as strong as I was hoping it would be but had a nice flavor. Dark, smooth, rich, caramel. Worked a treat in the espresso machine. An enjoyable cup. I almost exclusively drink medium/dark to dark roast and I brewed this with various ratios in my French press, but each time I drank this it tastes burnt. I was kind of happy when I finished it and the next one was delivered. This coffee is SO GOOD. And it grinds evenly in my cheap coffee grinder too, which is another plus. Lets try something a little less smoky and maybe a little lighter roast, not quite so darK? Robust and strong punch for espresso or espresso-based drinks - probably the best bet for this particular roast vs. pourover, FP, etc. Definitely my favorite so far. Strong and punchy, just what you need when waking up for your first cup. Good for a dark roast, though I am not a fan of dark roasts. Another French roast, and this one felt like a more typical French roast with that harshness or almost tannic taste. It's a decent coffee, but not one that is particularly memorable for us. It has a smooth and mild flavor hitting the notes as described in the description. However, it doesn't have a strong aroma, which mutes the overall tasting experience. I was surprised not to be a fan of this one! An excellent roast! Especially smooth with substance! I would highly recommend it! In the end, this process has helped me appreciate what I do like, a dark as my soul french roast ground as fine as my grinder will go and steeped too long. This roast was not bad, but it left me wanting for a cup of coffee that would probably put most people off. For a French Roast, this was a disappointment. Really a 4 1/2 stars. It was very good but as I said in my previous note, I preferred the Dillano's French, so I reserved the 5stars for that one. Smooth and the caramel flavor is great! Very rich dark coffee! This blend makes *really* coffee or expresso. One of my favorites but just *barely* behind the Equator organic blend. One of if not my favorite coffees from mistobox. At first I thought this was lacking flavor but then I amped up the dosage and it kicked in nicely. Prefer this to the Dillanos, which I found ok, very similar to the Illy dark roast I keep for emergencies. I might prefer the color of the beans a bit lighter and the 'darkness' a little lighter, but don't want to lose any flavor. Looks and smells great, but coffee was a bit weak. Had to increase the amount of coffee by 20% to fill it out. Not a big fan of the molasses flavor. Prefer a bolder brew. This coffee was far too sour for me. Still drinkable, but not something that I would like to receive again. I prefer a smooth, but strong flavor. Perhaps I got a bad batch, but this one made me cringe after each sip, rather than the preferred, "ah, that's good coffee". UPDATE: I tried brewing this coffee with my regular drip machine (rather than the French Press), and it turned out much better. I still wouldn't get it again, but it's quite amazing how different brews can be between batches. A little bit darker than I care for but good flavors. Good, but I prefer the Dillano's. I tried varying the grind on this but always had to use more than for any other coffee to get anything but weak "tea water." Flavor was good and completely without bitterness. The coffee had good flavor but it was too watery or too light no matter how we brewed it. No a fan. Molasses, hickory and smoke are right. Clean finish. But, not as strong as I would have expected. I can definitely tell the sweetness of this roast. It tastes a little weaker than my preference but I think that's because I became accustomed to drinking something a little bit bolder. I needed to use a little more coffee than I normally would have to get the strength and consistency that I wanted. Overall it is great and makes the house smell wonderful while brewing.